Not only are the corporations leaving, American citizens are, too. In both cases, it is taxes that are driving them away. 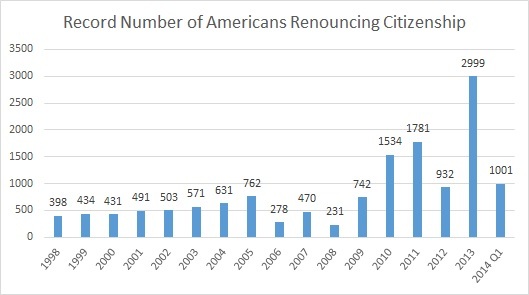 The Treasury Department announced this week that 1,001 Americans renounced their citizenship in the first quarter of this year. That’s more than the total renouncements in 2012 and about one third of the renouncements in 2013. So far 2014 is on track to be another record year. 3. The fear generated by the potentially bankrupting penalties for failure to file U.S. tax returns when an individual holds substantial non-U.S. assets. Of course, the “elephant in the room” penalty is for intentionally failing to file the FBAR (Report of Foreign Bank and Financial Accounts — now FinCEN Form 114). The monetary penalty for a willful failure to file this form is the greater of $100,000 or 50% of the account balance at the time of the violation. For example, say an individual has retired overseas and has accumulated a life savings of $1,000,000 that has been deposited in a foreign bank account. If that individual intentionally does not file the FBAR for 4 years, the penalty would be $2,000,000 (twice the amount of the cash in the bank).